The following story of the healing of Giovanni Savino is well-documented and backed up by factual information and analysis. Father Dominic Meyer, Padre Pio’s secretary for twelve years, wrote a detailed account of Giovanni’s cure in July, 1949. When the story were first publicized, it attracted great numbers of pilgrims to San Giovanni Rotondo. 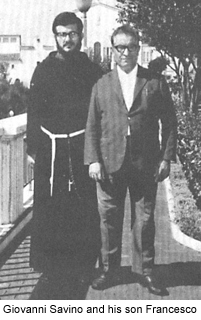 Giovanni Savino, a construction worker and a member of the Third Order of St. Francis, was a devoted spiritual son of Padre Pio. In February, 1949, Giovanni was working at Padre Pio’s friary, completing the construction of an annex to the monastery. The workers were leveling the ground and were getting ready to blast a huge boulder. It was Giovanni’s custom to attend Padre Pio’s Mass every morning before going to work. After the Mass, he would wait in the sacristy to receive a blessing from Padre Pio. Every day Padre Pio would place his hands on Giovanni’s head and pray for him. One morning, Padre Pio deviated from the regular routine. When Giovanni asked for a blessing, Padre Pio gave him a big hug and said, “Courage! I am praying to the Lord that you will not die.” Giovanni was terribly upset by this statement. He began to cry. “Padre Pio, what is going to happen to me?” Giovanni asked. But Padre Pio was silent. The next three mornings as Giovanni asked for a blessing, Padre Pio embraced him and repeated the same disturbing words. When he repeated the same remarks on the fourth day, Giovanni told some of the construction workers, “I’m afraid something is going to go wrong. Maybe we should not work today.” But the crew decided to proceed with the job of blasting and leveling the ground. That afternoon, Giovanni and another worker placed a charge of dynamite under a huge boulder. Giovanni lit the fuse but it failed to detonate. After a few minutes, he went over to check the charge. Just as he bent over, the dynamite exploded in his face. A shower of rocks hit Giovanni. The rock that he had been standing on fell on top of him and he lost consciousness. His face was badly burned and much of the skin was torn off. His left eye was filled with rocks and gravel. His right eye was completely gone. There was only a bit of raw flesh left in the empty socket. Giovanni was rushed to the hospital. His left eye was operated on but nothing could be done for his right eye. The doctor told Giovanni’s wife that both of her husband’s eyes had been destroyed. Padre Pio was informed about the accident and told that Giovanni had been blinded. “That is not for certain yet,” Padre Pio replied. One evening, after being in the hospital for ten days, while Giovanni was praying the Rosary, he smelled “the aroma of paradise.” It was a beautiful, heavenly smell. It was the sign that announced Padre Pio’s invisible presence. In the morning, when the doctor took the bandages off, he discovered that Giovanni’s face was healed and covered with new skin. He then examined his eyes. “I can see you!” exclaimed the injured man. “I can see you with my right eye.” The doctor insisted that he was seeing out of the left eye, as the right was totally destroyed. After further examination, it was clear that Giovanni was speaking the truth. He was not able to see with the eye in which the shrapnel had been removed, but he was seeing perfectly from the eye that had been shattered to a bloody jelly. Pietro Cugino, who used to visit Padre Pio’s monastery, said that one day, in the garden, while talking to some of the friars, Padre Pio suddenly said, “I’m blind. I cannot see anything.” After a time, Padre Pio’s eyesight returned. While we may not fully understand the meaning of this incident, we do know that Padre Pio was offering many prayers and sacrifices on Giovanni’s behalf and encouraging others to do the same. In thanksgiving for the miracle, Giovanni and his wife offered to the Lord the child she was then carrying. Padre Pio named him Francesco, and he grew up to become a Capuchin priest. Giovanni was not the only family member to be the beneficiary of graces through Padre Pio’s prayers. His children also received help in times of crisis. Giovanni’s young daughter, Lina, was on her way to a birthday party when she was struck down by a moped. This was before Padre Pio’s hospital had been built, so Lina was taken unconscious to a first aid station. She was in a coma and found to be suffering from a trauma to her head and severe internal bleeding. Giovanni and his wife rushed to the friary and told Padre Pio. As they described it, “He looked up to heaven as if he saw another reality,” and said, “Let’s pray and we’ll leave everything in Our Lord’s hands.” Afterward, Lina made a rapid and complete recovery. God is for us a refuge and strength . . . So we shall not fear though the earth should rock, though the mountains fall into the depths of the sea. Padre Pio had a great devotion to the Pope. Every day Padre Pio would rise at two o’clock in the morning and begin his prayers. His lamp had to be draped because the light would bother his eyes. But the drape had to be open so that a ray of light could hit the Pope’s picture which was always on his desk. Until the ray of light hit the Pope’s picture, he was never satisfied. That is how Padre Pio would begin his day – praying for the Holy Father. A short time before his death, Padre Pio wrote the following letter to Pope Paul VI. His words remain especially relevant today.
. . . In a spirit of faith, love, and obedience to the greatness of Him whom you represent on earth, I offer my respectful homage to your August Person. . . I know that your heart suffers much these days on account of the happenings in the Church; for peace in the world, for the great needs of its peoples; but above all, for the lack of obedience of some. . . . to the lofty teachings which you, assisted by the Holy Spirit and in the name of God, have given us. I offer Your Holiness my daily prayers and sufferings. . . asking the Lord to comfort you with His grace to continue along the direct yet often burdensome way–in defense of those eternal truths which can never change with the times. May God grant the triumph to the truth, peace to His Church . . . so that when these disturbing clouds pass over, the Reign of God may triumph in all hearts, through the apostolic works of the Supreme Shepherd of all Christians. Prostrate at your feet, I beg you to bless me, my Brothers in religion, my spiritual children, the “Prayer Groups”, all the sick–that we may faithfully fulfill the good works done in the name of Jesus and under your protection. Pauline Bongiovanni of San Diego shared her testimony at one of our Padre Pio devotions, regarding the grace her family received through the intercession of Padre Pio. Her story was so powerful and inspiring that we wanted to include it here. 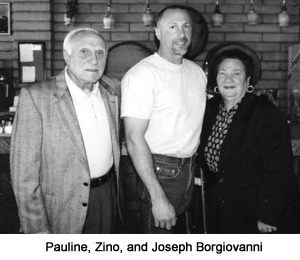 In 1972, Pauline and Joseph Bongiovanni’s ten year old son, Ignazio (Zino) Bongiovanni, was diagnosed with osteosarcoma, one of the deadliest and most aggressive forms of bone cancer. It was already in a very advanced state and Zino was given three months to live. The doctor said that nothing could be done for Zino. The Bongiovanni’s took Zino to another doctor in order to obtain a second opinion. The second doctor came to the very same conclusion. Pauline asked the second doctor if there wasn’t something that could be done for her son. The doctor said that he could amputate Zino’s leg but he did not recommend it because even if this measure was taken, his chance of survival would be only five percent. The doctor said that perhaps it would be better to let Zino live according to the time that was left to him without having to undergo the trauma of an amputation. Pauline and her husband had a big decision to make regarding their son’s medical treatment. One day, in a great state of anxiety, Pauline went into the hospital chapel and knelt to pray, asking for guidance. A few moments later a man entered the chapel. He touched Pauline gently on the shoulder and asked if there was something he might do to help her. Pauline was embarrassed by her tears so she did not turn around to look at the stranger. She shook her head to indicate that she did not care to talk. A few moments later, the man tapped her on the shoulder again and said: “Please let me help you. Maybe I can give you some advice.” Pauline was startled by these words because at that very moment she had been praying to the Blessed Mother, asking for advice. She once again declined to talk to the man. As the kindly man spoke, Pauline felt that his words were filling her with renewed hope and courage to face whatever lay ahead. She left the chapel to tell the doctors she had decided in favor of the operation and when she went back to the chapel to thank the man, he was gone. She asked many people in the hospital but no one had seen him. Pauline thought about the man many times through the years. For a reason she did not quite understand, he had made a tremendous impression on her. She would never forget him. How she wished she could have thanked him for what he had done for her. She wished she could tell him that her son did indeed beat the odds, and was alive and healthy. When Pauline looked at the photo, she couldn’t believe it. It was the kindly man she had thought about so many times through the years, the man who had reminded her of St. Joseph. It was the man who came into the chapel at the hospital during the darkest time of her life, whose words had filled her with hope and courage. It was Padre Pio.